Northern Light AR Gould Hospital celebrated nine students on Monday, Nov. 19, for graduating from the hospital’s second Certified Nursing Assistant (CNA) training program. PRESQUE ISLE, Maine — Northern Light AR Gould Hospital celebrated nine students on Monday, Nov. 19, for graduating from the hospital’s second Certified Nursing Assistant (CNA) training program. The program provides free training and even employs students during the seven weeks. This marked the second offering of the training opportunity through a partnership with the Presque Isle hospital and SAD 42 Adult Education in Mars Hill. The most recent class began in October. Northern Light AR Gould Hospital and Northern Light Continuing Care (the hospital’s long-term and skilled nursing facility in Mars Hill) have both struggled in recent years to get the CNAs needed to provide vital patient care. This resulted in the concept of “growing their own,” which led to this program’s creation, hospital officials said. Students received hands-on training at both locations to better prepare them to work at either site. Classes were held daily, Monday through Friday, for seven weeks. Knowing that this accelerated pace would make it challenging for participants to work outside of their training, the hospital hired students and paid them an hourly wage while they were completing their classroom and clinical training. Nine students were accepted into the program and successfully completed it, more than double the size of the pilot class. Graduates were Kylie Bouchey, Lisa Lorenzo, Valerie Munn, Randell Peterson and Shanae Reed, all of Presque Isle; Bobbi Jo Bernier of Westfield; Amanda Parenteau of Blaine; Nashali Parks of Mars Hill; and Stephanie Tilley of Masardis. 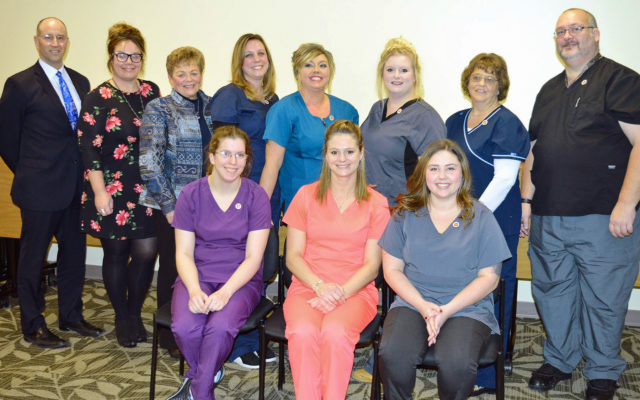 “These nine individuals demonstrate all of the characteristics it takes to shine and thrive in healthcare,” said Odette LaPointe, RN, lead instructor for the class. During the ceremony, LaPointe shared with graduates the five qualities that she learned to embrace and live by everyday: compassion, a positive attitude, patience, empathy and love. “Although the days are busy and the workload is always growing, there are still those special moments when someone says or does something and you know you’ve made a difference in someone’s life. That’s why you became a caregiver,” she told them. All nine graduates have been hired by Northern Light Health to work at either AR Gould Hospital or the continuing care facility in Mars Hill. Submitted by the Communications Office of Northern Light AR Gould Hospital.